Cox Wireless has decided to get out of the retail wireless business. Cox has their own wireless spectrum, but decided to offer wireless as an MVNO with Sprint instead. It was a nice idea for Cox to be able to offer their customers a wireless component to their communcations bundles, but it wasn't worth the trouble. Qwest, now CenturyLink (CTL) found that out, too, and eventually partnered up as an agent for Verizon Wireless (VZ). 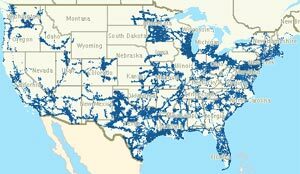 Frontier Communications (FTR), a rural wireline operator, has learned from these mistakes and has decided to add a wireless product to their bundles with an agreement with AT&T (T). Frontier will act as an agent for AT&T and not as an MVNO. One minor effect is that Frontier becomes another communications provider that will probably not be interested in buying a wireless network, like, oh, maybe T-Mobile. What will happen to the Cox wireless spectrum at 700 MHz and AWS? They might be hoping that AT&T might be spectrum shopping sometime next year.